Click a link below to navigate the Culver Citizen historical collection or click here to browse latest additions (sorted by latest posted). 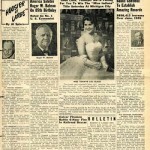 View the 1896 – early 1903 papers under The Culver City Herald here. Under the section “Search This Site”-when you put a surname in and the results come up, I am only able to access the first 9 columns/pages of results even though more are listed. I can see the numeral “10” off to the right but I am not able to click on it or tab to the right to access. Please advise as to what I need to do. Thanks for all the publications & newspapers you are posting! Tammy – the Google Search widget appears to be displaying in a way that clips off the “next page” button; thank you for pointing this out! We will be looking for a solution to this rendering issue immediately. In the meantime, you can do the same search directly from google.com by typing in “inurl:culverahs.com” before your search terms. Just make sure to leave out the quotation marks and put a space between the search limiter and your search terms. The search will return the same amount of results, but you will be able to navigate through all of them (as opposed to only some). Sorry about the rendering error in our widget, we’ll get that addressed! Thank you very much! I appreciate all the information you have posted on this website. It is tremendously helpful!